What do racing horses have to do with Plain buggies? And why do some feel safer in a buggy than a car? Reporter Corey Kilgannon recently visited Plain communities in New York to learn about buggy safety from the local Mennonite and Amish populations. The result is a pair of articles in the New York Times. In “Quaint Buggies, With a Deadly Side“, Kilgannon explores the issue, explaining the challenges and nuance (e.g. not all Amish are the same in how they approach road safety). The second is more of a personal account of the author’s experience writing the story. I was glad to see that the topic of buggy safety has gotten attention. Common sense suggests more awareness is a good thing. And New York is a good place to report on this issue, having one of the fastest-growing Plain populations. On the other hand, to play devil’s advocate for a moment, national attention could also inspire more state-driven solutions which fail to incorporate Amish practices and beliefs (and sometimes common sense), as we recently saw attempted in Wisconsin. Still, on balance, I believe the more drivers are aware of the issue, the better. 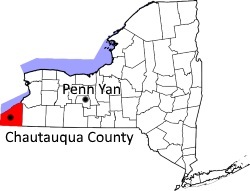 Kilgannon spoke with both Amish and Mennonites in Penn Yan (Yates County) and Chautauqua County, including Ivan Martin, a 63-year-old Old Order Mennonite man, as well as experts from law enforcement and academia. 1. Buggy drivers prefer retired race horses – What makes them better for pulling buggies? For one, they are fast, and secondly, they are used to distractions, making them difficult to spook. 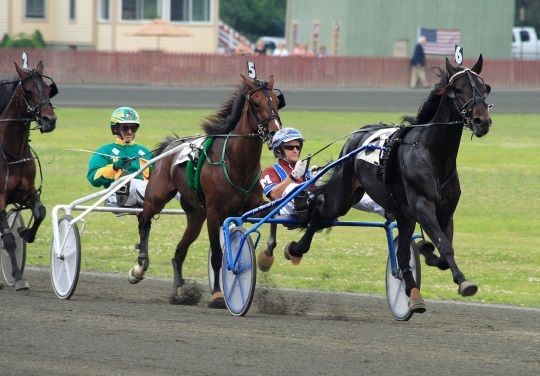 So buggy owners seek harness racing horses at auction. The minus is that if they do happen to startle, they take off like a rocket. 2. Many buggy accidents go unreported – Why? Insurance, or aversion to it, plays a role. NY State Police Sergeant Bernard Kennett says that uninsured buggy owners opt to negotiate cash payments when accidents happen. They also commonly refuse medical attention (I assume the lack of medical insurance plays a role in this aspect as well – Amish typically negotiate terms directly with medical providers). 3. 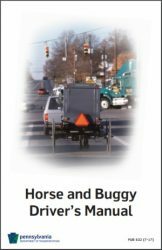 Plain communities produce buggy safety manuals – Though they may balk at some state-driven attempts to regulate them, Amish have taken steps to improve and formalize their approach to safety. Plain communities have created formal safety guides outlining what buggy drivers can do to ensure road safety, both for themselves and for car drivers. New York has produced a manual based on an earlier effort in Pennsylvania. You can view the PA manual here. 4. 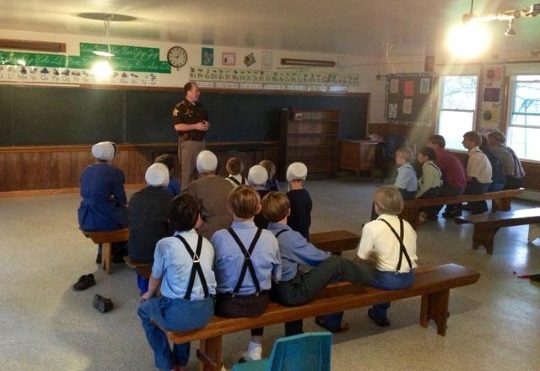 Police give safety presentations in schools – Amish involve themselves with law enforcement to varying degrees. One area where cooperation has been good is in the area of community welfare and safety (as seen in examples of drug awareness talks or bicycle safety). In this instance, the Yates County sheriff’s office has given talks in Mennonite schoolhouses on both buggy and bike safety. It seems that the more traditional the group, the more this outlook becomes a guiding force on the safety decisions of a community (see examples such as some communities’ refusal to use SMV triangles, or home smoke detectors). 6. Some feel safer in a buggy than a car – This one surprised me. I’ve ridden in buggies on many occasions. All things considered, I have never felt safer in a buggy than in a car. But Ivan Martin feels differently. While conceding that buggies offer little protection, he says that “we can get thrown clear into a field and be injured less than being trapped in a car,” and that “the flimsiness of the buggy actually helps you. So I still feel safer in a buggy than a car.” I wonder how many share his view. I believe that most of the accidents and deaths are due to automobile operators. They do not mind using Amish products nor do they mind the revenue they bring in by “lookie lous,” but drivers believe the roads belong to them and they should have right of way in all instances. I have found this to be more prevalent as the amount of “refugees” are brought in and continue to operate motorized vehicles as they did in their home country. I have spent several years overseas and home country drivers scared the heck out of me. Some have no idea what a red light means, what a stop sign means and most important, no common courtesy. My mother’s side of the family began Old Amish in Pennsylvania and have since moved to electricity, etc. I feel for those that have to put up with drivers that are so callous towards buggies. I believe that those states with Amish communities must ride in a buggy on a main highway at least one time. Maybe that will help sink in that the Amish are people and worthy of life, just as they are. I am certain distracted driving (whether it be from alcohol or texting) is a major contributing factor in road accidents and not primarily due to newly transplanted refugees. Sadly, it is very dangerous for all concerned. Loss of life is terrible regardless of where we are from. Must agree with your words. In my area, we have many people move from the western shore to the eastern shore. They have brought their horrible driving habits with them to our laidback lifestyle. It’s amazing how many people do not stop at stop signs or rip through red lights. I might also add (clearly off the subject) they have driven prices so high that being born and raised in the area you are unable to buy a home, etc. Sorry for my digression, but this also irks me when they move from one area for a better life and then do their best to change it to fit their needs instead of acclimatizing themselves to the region they moved. This article is especially interesting to me, because though I am not “Plain”, I do have driving horses. Ten, fifteen, twenty years ago I would think nothing of hitching a single or a team and taking a buggy, wagon or whatever out on the highway. Not anymore. People today will flat run over you; and it really doesn’t matter why they did it. Of course, not being Plain I have other transportation options. They don’t & I feel for them because of it. Ren’s comment about “new” people moving to her area resonates with me. Our area is being inundated with people moving in from the big city, 60+ miles to the East (Houston), and it is easy to decry “those Houstonians” for their poor driving habits. Though the truth is the majority of people in Houston are from somewhere OTHER than Houston. In fact, they come there from all over the world. It is possibly the most International City in America … so who knows where they really come from? Besides, how does anyone really know if they even moved to our area from Houston or not anyway? Really, though I think it is something else at work here: Impatience. I blame that on computers, more specifically the Internet. 20 years ago in our area, we all used a dial up modem & sat patiently while it squawked and squealed as it made connections. Then we clicked on an icon and waited and waited while it loaded. Now we all have high speed internet service and when we fire up the Mac or PC we are greatly put out if it doesn’t paint the desktop in 5 to 10 seconds, or less. Who in their right mind would wait 30 seconds for a web site to load? I WANT IT NOW! We want to buy something that is not available locally we no longer fire up the Ford or Chevy and drive into the city to shop for it. We fire up the Dell or whatever and order it from Amazon. 3 to 5 days standard delivery? Heck no, I want here tomorrow. In some urban areas; order in the AM, it is on your porch that PM. Everything is RIGHT NOW, IMMEDIATELY, PRONTO! The Internet has taught us that this is a birthright, or so we have come to believe. So we get out on the road and get to a four way stop. Who is going to wait their turn? No one under the age of about 30, I can almost assure you of that. Increasingly no one else is either. If you are at a Red light and it turns Green, you darn well better not proceed through the intersection without looking for that driver that is going to stretch that Amber light into about 2 to 3 seconds of the Red light; because they are there and they will run slap over you. Why? : Impatience. Everything is RIGHT NOW, IMMEDIATELY, PRONTO! My state has one of the longest borders in the world between a First World nation and a Third World nation and I can tell you from having been there a lot (as a youth, too dangerous to go there now) that Mexican drivers are very cavalier in their driving habits. It is like: I honked first, so I have right of way through the intersection … no matter the color of the light. And, yes they bring those same driving habits with them to the US regardless of their legal status. But are their driving habits really any worse than the typical American driver? No, not really. Why? : IMAPTIENCE. For years I have stopped any time I see a turtle crossing the highway. I put on the flashers, get out and scoop my little friend up and deposit him/her(?) on the other side of the road. My logic is that they didn’t ask us to come put up highways through their habitat, we did that on our own. Besides, it is not their fault that they are a quarter of a mile per hour(day?) creature in a 70 MPH world. If someone doesn’t help them they don’t stand a chance. It seems to me that the Plain people are in the same boat as my hard shelled friends. As a society we drive too fast, too aggressively and too carelessly for anybody’s good. My 2 cents. Rant over. If I Act Like A Turtle, Then I Can Be As Thoughtless As A Turtle! This Is Not About Everyone Else! Individual driving habits IS NOT what this article is about. The LAW deals with that and has for decades. Even though drivers are alert and driving within the legal speed limit our delicate commentators think everyone, that is EVERYONE should just drop well below the posted speed limit because there might be a child dressed in gray or black walking around in the black of night or a buggy out here with a confusing noncompliant light somewhere in the road and we need to be sensitive to their spiritual interpretations. This is Utterly incredible insulting Amish community intelligence with these crippling excuses. It’s pathetically reprehensible that a simple answer so obviously beneficial as “getting legal for safety’s sake” is diverted by “cultural remorse that paralyzes anyone in this culture from doing anything correctly and predictable. Anyone who would take a clear, concise solution to a clear and dangerous situation is deserving of the title, “SNOWFLAKE.” It is as if you clean your glasses with salad dressing! Clear, visual, safety markers on all vehicles is the law. Why? Safety, Everyone’s safety, including mine AND including the delicate ones here who are just as capable of having an accident as anyone else. My Amish friends– You want to be out on the road? Then get the right lights like everyone else. Prevent the loss of your family’s future and mine! And if that goes against your interpretation of God’s plan, I would challenge you that God never intended for a horse drawn buggy to be on an asphalt highway in the first place. Stick to Cow Paths. How does your View of “Singular Slice of Impatient American Drivers” save the lives of the Amish in buggies OldKat? Do you and the other cultural apologists here REALLY think it is too difficult for the head of the Amish Family to slap legal lights and reflectors on his buggy instead of confusing solid amber lights?! Really?…………..
OldKat, I agree with you and especially how eloquent you wrote. I am very concerned about the solid amber lights that illuminate the Fort Plain buggies. The first time I saw them I was completely befuddled. As always that night, I cruised along at 55-60 m.p.h. on a county road I traverse weekly. I was very aware of the road and various landmarks that I could see at night, houses, barns, fences etc. All of that while pressing harder and harder on the brakes happened in just 10-15 seconds. This county road is designed for high speed vehicles. Any vehicle incapable of those speeds OUGHT to have slow flashing red rear lights and slow flashing white front lights. The reason I say more than one light, front and back is for a very critical reason– one on the left corner and one on the right corner, front and back. Without them, I cannot tell how wide your vehicle is. As for my mountain bike which I have peddled at night– one quickly flashing red light in the rear, and one quickly flashing white light in the front is critical! Quickly flashing lights say BICYCLE! In other words, one narrow vehicle which OUGHT to be over on the shoulder. As a cyclist traveling at night I always use a little round mirror hanging on my glasses as well as a mirror on my handle bars. Often times I don’t hear the vehicle coming up on me and I’m very glad to know I have the most predictable visual cautions available for the other guy to avoid me. When I do catch a view in my mirrors, that solid white light getting brighter in my mirrors says big fast moving vehicle. Get over on to the shoulder! Amber is a terrible idea for a road light. Maybe the amber light gives our Amish friends, as we say in the English community, “a warm fuzzy” feeling to connect to the old ways but when you are out there at night on the highway that is no place for “warm fuzzies” when it comes to you and your family’s safety. Thank the Lord, my God in heaven for sparing us all the tragedy of that first meeting with a solid amber light. So now, I am quite aware of the solid amber light in the Fort Plain area. You won’t have to worry about me in the future. I will be ready. But, just multiply this experience times all the drivers, unaware, traveling over that road throughout the year who could come up on you at night in the very same way. Do you still feel safer in your buggy than the car? His Father grants ALL (chosen or not) who ask for it, the gift of Wisdom. We should all embrace that gift to reduce potential dangers that can be avoided thanks to his gift of rational decision making. God gives us the divine privilege of free choice. But, He does not give us the divine privilege of changing the results of the terrible outcomes as a result of the choices we made. We ourselves are left to live with them. How else will we ever learn of His glorious ways? Hopefully, food for thought for my Amish brothers and sisters in Christ. Why did you feel it necessary to drive that fast at night? I do not know the area you are talking about and am curious if the road is straight, curvy, hilly, etc. Is it a major highway or country road? I have a hard time believing that someone would drive up to 60 miles an hour, at night and knowing that it is used by the Amish buggies. Am I being stupid to believe that you were more concerned with getting where you wanted to go then ANY hazards on the route you were taking? Sir, I too, have to question why you would be out driving so fast in a known Amish area. Just because you “can” does NOT always mean it’s prudent or necessary. What if there had been a person walking along the shoulder of the road? You can have every so called safety device known to man on your vehicle, that does NOT mean people will pay attention to them. The BEST safety device is SLOW DOWN & pay attention. THE national 55 mph speed zone has been standard operation on a million miles of open country roads for the last 70 years. I laid in great detail very specific reasons for what and why EVERY driver abides by standard safety measures on a public roadway. Shame on you for your presumptuousness. Stop your apologizing to our Amish friends for every English cultural sin. Grow up. 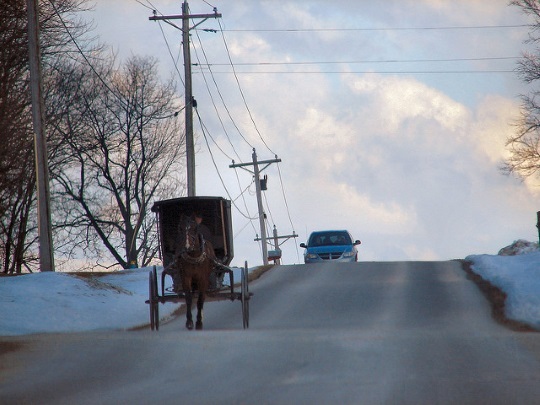 Recognize, and acknowledge a serious safety issue that requires VERY LITTLE EFFORT on the part of our Amish friends in order to increase greatly, their level of safety, with ALL drivers out on our public roads. Here’s something that will help you understand. Early November, two of my Amish friends were rear ended (for a second time in their lives.) 30 mph speed zone on the edge of a small village. Friday night, 7:00 pm after dark, but under a street light. Both go to the E.R. by ambulance. For him, a cracked ribs. For her two broken vertebrae. Both lost their glasses. Broken horse harness. Smashed buggy. As I type this, I have waiting for me a stack of paperwork for the insurance company on their behalf. To date, I have driven them on 16 occasions to doctors, optometrists, and x-ray departments over 350 miles. How did it all happen? The driver of the pickup truck said he was looking down at his pizza on the way out of town. So let’s keep it real dear ones. I was driving sober and alert within a 5 mph of the legal speed limit. I would bet my last dime that if you smashed into a buggy with a single solid amber light you would have your lawyer all over them for it to preserve your pure driving record and low insurance rate. We all know whitetail deer come upon vehicles before drivers can avoid them. If only we could put a reflective band, tape, vest, anklet, flashing headlight on them we would of course. But, we can’t. Fortunately an Amish parent can do just that before sending their child in gray/black clothing down an unlit country highway. WOW, what a diatribe from a Christian. All, I can say is you’re entitled to your opinion as I am to mine. I assume you are complaining to me? #1 I am 64 years old and have never been in or caused an accident. The speed limit is there for a reason. I might add calling me a snowflake was hilarious. This is the first time in my ultra-conservative life I have ever been called a snowflake. I am as far from being politically correct as you can get. I don’t buy into their mumbo-jumbo. So, if you want to call me a snowflake for pointing out how dangerous it is to drive at night doing 60 MPH in a 50 MPH zone, I would love to contact my counterpart in your area and have them funny lights flashing in your rear view mirror. Thank you for your comments; it only verified what I and others commented. I am very familiar with Penn Yan and drive through on a regular basis. My mother grew up on a farm on Rt. 14A, which is the large, 55mph road going down into Penn Yan, then up the other side towards Milo and Dundee. It’s not only a straight/hilly, high-speed area, but a major trucking route. So factor in semis going 55mph+ in addition to regular vehicles. As a car driver, the high, long hills give you the impression that your visibility is excellent. I do know of several fatal accidents involving “horse and buggy” Mennonites, but the general impression I get is that drivers are very careful and usually know to slow down and move over. The Mennonite buggy drivers are also very savvy navigators, and bikes are very very popular with the kids in that area. Even though drivers are alert and driving within the legal speed limit our sensitive commentators think everyone, that is EVERYONE should just drop well below the posted speed limit because there might be a child dressed in gray or black walking around in the black of night or a buggy out here with a confusing noncompliant light somewhere in the road and we need to be sensitive to their spiritual interpretations. Utterly incredible!! 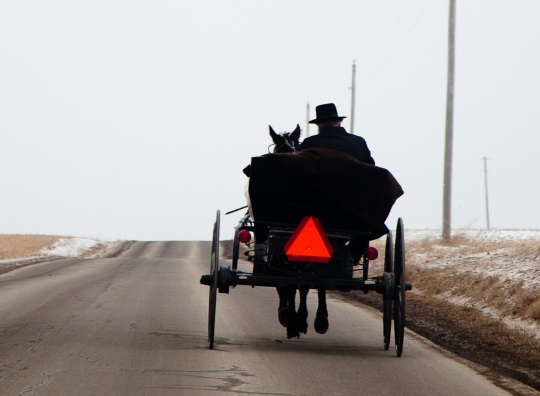 Wisconsin passes common sense safety requirements for Amish buggies. As the dairy farmers hang it up in my area the Amish have moved in rapidly. The last 5 years it is exponential and we are not used to buggies on our narrow, hilly, curvy, dark roads. Horse poop on roads where it has not been present in 80 years. Black buggies driving at night without lights is willful negligence that endangers everyone to include the horse. Thank you Governor Walker for protecting everyone’s safety.